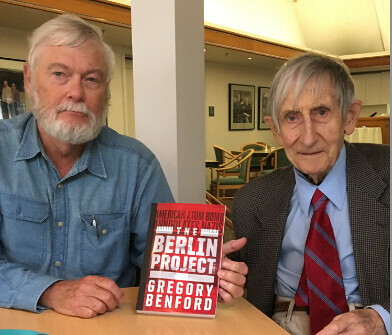 For author and scientist Gregory Benford, his new novel The Berlin Project isn’t just a matter of speculative fiction — Benford has some very real connections to the people and characters that play a role in his alternate history. Benford’s here to lay out where fact meets fiction meets friends and family in this tome. I chose to portray that era through the people I knew who were embedded in the science side of the conflict. Any portrayal of real people in fiction is an interpretation, but knowing them certainly helps. I knew personally many figures in this novel: Harold Urey, a Nobelist who first greeted me and my twin brother at the grad students reception at UCSD in 1963; Karl Cohen, my father in law; Edward Teller, my mentor as his postdoc at Livermore Lab; Maria Goeppert Mayer, for whom I graded the homework and exams in her graduate nuclear physics course at UCSD; Freeman Dyson, whom I met at the UCSD daily coffee in 1963; Leo Szilard, another coffee break savant; Luis Alvarez, whom I invited to give a colloquium at UCI, because I wanted to meet such a fabulous character, and whose account of the Hiroshima bombing I used here; Richard Feynman, an idol to all of us; Sam Goudsmit, raconteur extraordinaire; Paul A. M. Dirac, Nobelist; John W. Campbell, editor of Astounding; Fred Reines of UC Irvine, Manhattan Project physicist and winner of a Nobel in 1995; Arthur C. Clarke, who was a radar officer in the war and then a science fiction writer. Plus many others. I have tried to echo their manner of speaking and thinking. Indeed, I included my own father, James Benford, who went into Normandy on the fifth day of the invasion and fought across France, Luxemburg, Germany and Austria. Further, every document quoted in the novel is authentic, though some have dates altered to conform to the plot. WWII is the drama that keeps on giving, for it touches on many problems we have today, especially the role of all-powerful weapons like nuclear, biological and chemical ones. One of the major characters is still alive: Freeman Dyson, now 93. I gave him an advance copy recently, as the photo shows. 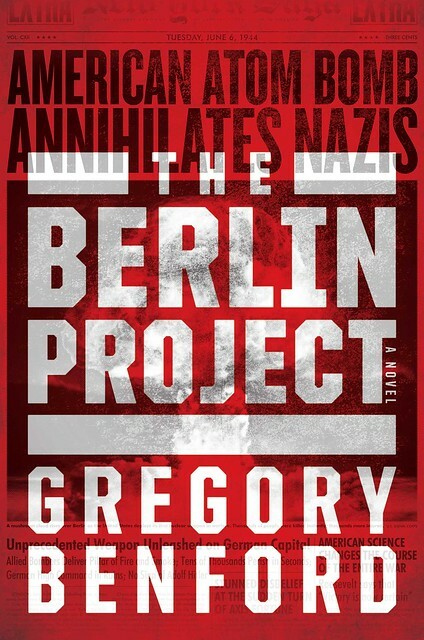 He liked the novel’s “specific premise,” as he put it: that the errors in judgment at the beginning years of the Manhattan project might well have gone differently, yielding a very different World War II. At the end of The Berlin Project we get to see that world in 1963, the year I began graduate school. There are plenty of wars since, but none like WWII, which killed 29 million Soviets alone, and over 60 million in total, about 3% of the world population (over 80% of them among the Allies). Such a mixed nuclear and tactical war could lie in our future, so this thought experiment has implications for our real world in the 21st Century. The next war that sees nuclear weapons used will probably also involve substantial ground forces. Think of Pakistan-India and the deep angers of the Middle East, where resort to nuclear weapons seems inevitable among demons posing as religious purists. But my major reason for writing The Berlin Project came from the sheer fun of it. The physics I knew already; I helped design tactical warheads while a staff member at Livermore, after my postdoc, and before I became a professor at UC Irvine. The intricate interplay of great minds in pursuit of a desperate goal, the Manhattan Project, I did not know well. But I learned, pouring through much history buried in obscure documents. I found the ID badges for the Manhattan Project and put them in the novel, along with dozens of pictures from that era. In an historical novel, show the reality as much as you can. My sense of the story gathering momentum as the war changes its flavor drove the writing. The battles change, the possibilities blossom. This has been perhaps my most enjoyable project, ever. Listen to an audio excerpt. Visit the author’s site. Visit him on Facebook.